Consumer Cooperatives Act regulates consumer co-ops; the act classifies the co-ops into categories according to the type of business and does not permit consumer co-op to do banking business. Each consumer co-op is permitted to do business only in the prefecture where it is registered. In principle, non-members are not allowed to use co-op's services. Community-Based Retail Co-ops serve local residents through home delivery, store and catalog business, insurance and welfare service. University Co-ops serve students and faculty members in universities and colleges through operating bookstores, convenience stores, cafeteria and other services. National Federation of University Co-operative Association (NFUCA), which is affiliated to JCCU, is the national association of university co-ops. School Teachers' Co-ops serve teachers at both public and private elementary, junior and senior high schools, mainly through catalog business. Institutional Co-ops serve employees at their work places through operating stores and canteens. Expanded Institutional Co-ops serve both employees and residents in neighboring residential areas. Health and Welfare Co-ops provide medical and nursing care services to local residents, and manage hospitals, primary health care centers, nursing care homes, home-visit care stations, rehabilitation facilities and at-home help services for the elderly. Japanese Health and Welfare Co-operative Federation (HeW CO-OP JAPAN), which is affiliated to JCCU, is a national federation of the health and welfare co-ops. Insurance Co-ops offer life and other insurance products that suit members' needs with more reasonable premiums and better coverage. There are two types of insurance federations that are affiliated with JCCU; Japan CO-OP Insurance Consumers' Co-operative Federation (JCIF) and the National Federation of Workers and Consumers Insurance Co-operatives(ZENROSAI) . Housing Co-ops provide houses, make extension or reconstruction of buildings etc. to co-op members at reasonable price. ZENJUREN is a national federation of housing co-operative societies, which coordinates the business of housing co-ops. It includes independent regional housing co-ops that are affiliated with JCCU, that provide services to their members in cooperation with real estate developers. 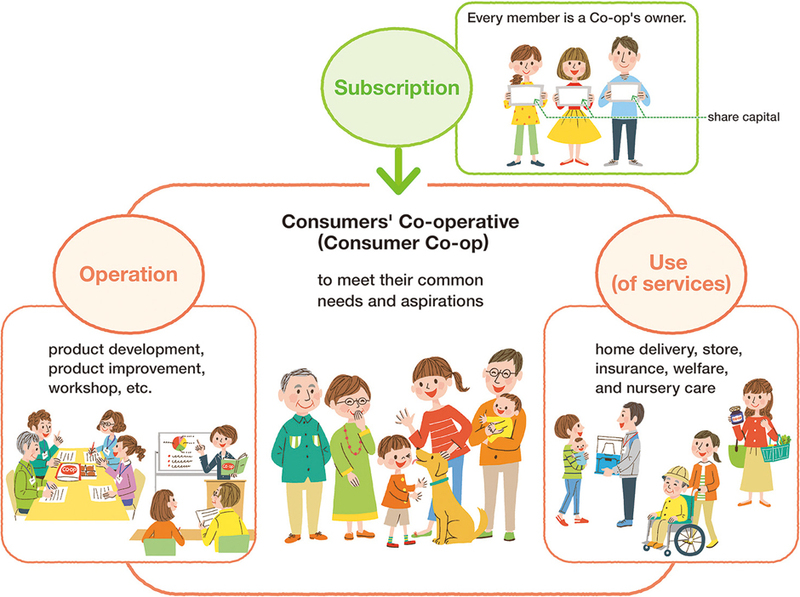 In Japan, the supervisory authority for consumer co-ops is the Ministry of Health, Labour and Welfare, and the act on which they are governed is Consumer Cooperatives Act. Similar to other types of co-operative associations, they are given tax concession. They perform their business independently from the government and are granted no subsidies.